Wingecarribee swamp had the highest known species and habitat diversity of any peatland swamp in Australia. This included approximately 120 higher plant species. Due to the diversity of plant species and vegetation formations - sedgelands, rushlands, reedbeds, aquatic herbfields, mossbeds and tussock grasslands, the swamp provides a diversity of habitats for the breeding, feeding and refuge of many native birds animals, reptiles and invertebrates (insects). It is an outstanding freshwater upland mire containing a complex of vegetation types and diverse flora... Wingecarribee Swamp contains a number of rare and significant plant species, including the threatened herb Gentiana wingecarribiensis (Ne) which is endemic to the site... The rushland dominated by Lepyrodia anarthria is one of the richest and most extensive of this type of community in Australia. 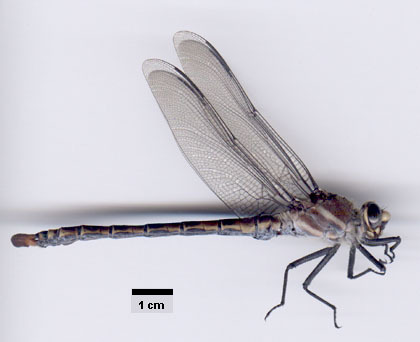 Petalura gigantea is one of the worlds' largest dragonflies, growing to 20cm long (see photo). It occurs only in Wingecarribee Swamp and possibly in a small swamp in the Blue Mountains, although it has not been seen in the Blue Mountains since the early 1940s. The larvae survive in the swamp mud and peat for a minimum of six years but up to thirty years. The larvae spend the daytime in their mud burrows and emerge at night to feed on the surface of the swamp making it an unusual semi-aquatic species. The Family to which the Genus Petalura belongs, dates back to the Jurassic period. There are only nine species worldwide with four being endemic to Australia. (two from Cape York, one from WA and one from NSW). The species is dependent upon Wingecarribee Swamp for its survival and due to its unique behaviour and larval longevity, it requires its habitat to be undisturbed for as long as 30 years to enable just one years recruitment of cohorts (young). Two rare and threatened herbaceous plant species, Prasophyllum uroglossum - Leek Orchid and Gentiana wingecarribiensis - Swamp Gentian have been found at the swamp. They are both Schedule l species on the Threatened Species Conservation Act. Also a native gum-tree, Eucalyptus macarthurii - Paddy's River Gum or Camden Woollybut, of very restricted distribution occurs in the near vicinity of the swamp edge. Photo of Petalura giganteaby John Trueman, http://www.anu.edu.au/BoZo/trueman/labsite/petalura.htm, 2000 (More photos and info available at this site). National Parks and Wildlife Service, Submission to the Mining Wardens Inquiry into Possible Renewal of Mining Leases for the Extraction of Peat from Wingecarribee Swamp, 1997, Exhibit 23, p. 7.